The media’s obsession with the “crisis” of masculinity has long reached a feverish, cliché-filled pitch. “We’re losing our boys,” one article proclaims. “We must save the males,” says another. It’s unnerving, particularly since that identity crisis is pinned on the advancement of women in formerly male-dominated spheres. 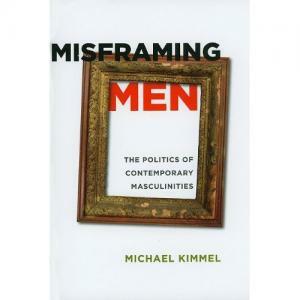 There is a masculinity crisis, according to Michael Kimmel’s latest book Misframing Men. But it has nothing to do with women “invading” formerly men-only spaces or men taking on more responsibilities at home. Instead, Kimmel posits, men—particularly young men—are being confronted with media stereotypes and a public discourse that attempt to put them in a rigidly stifling box of masculine identity. And the more men struggle to fit themselves inside this frame, the more apparent it becomes that such a frame is doing a grave disservice to them. Kimmel does an excellent job weaving together the economic, political, and social contributors to this masculinity crisis while avoiding the over-conflating (and overreacting) he is so critical of in the media. His debunking of gender symmetry in domestic violence articulately critiques a quantitative tool for measuring domestic violence (the Conflict Tactics Scale) through a stern analysis of the differing intentions and severity of male- and female-perpetrated violence. He negates the claims of gender symmetry supporters who believe the solution to violence perpetrated by both genders is to decrease the amount of funding for women who are survivors of domestic violence by suggesting an overhaul on how our culture approaches the causes (and solutions) of interpersonal violence. His discussion of the struggle to make the Citadel and Virginia Military Institute co-ed—an arduous legal process for which he served an expert witness—is approached with no less of a degree of professionalism and intentionality. Critics bemoaned the attempt to “de-male” these institutions as another “threat” to men’s rights and happiness. Yet, as Kimmel points out, the rationale for keeping women out of these institutions has been mired in stereotypes and wholly ignorant of reality. As he poignantly concludes, the best way to strengthen these institutions is not to continue to seal them off from the outside world (and women). Rather, Kimmel states, “In a context of equality, the assumed differences between women and men will be revealed as stereotypes that help neither women nor men nor the institutions in which we find ourselves.” It is this striking eloquence that makes it my favorite chapter in Misframing Men. Kimmel ends his book on a high note, reflecting that—despite allegations that young men are buckling under the pressure of women’s equality—young men on college campuses are happily adopting the “identities, practices, and ideas” of gender equality—in essence, constructing a new frame for themselves. It remains to be seen whether the media takes notice or chooses to remain mired in the sand of their manufactured obsessions.